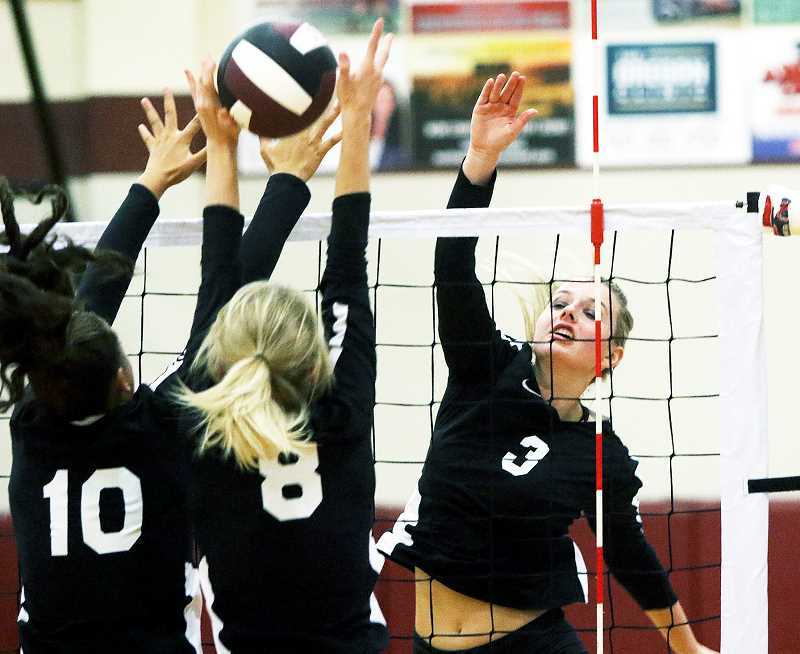 Newberg's 3-0 road loss to last-place Century Oct. 2 was a major setback in the team's pursuit of a top-three finish in the Pacific Conference and automatic state playoff bid, as the Tigers had just four games remaining on their schedule. NHS coach MacKenzie Upchurch's squad quickly revived their playoff hopes, however, with a 3-2 win at Sherwood Monday night. Newberg (10-8, 5-4 Pacific Conference) now sits in a tie for fourth-place with McMinnville and trails both the second-place Bowmen and Liberty, both of whom are 6-4, by just half a game. The opening set Monday night was about as back and forth as possible, with the Tigers taking early leads at 7-4 and 10-7 only to have Sherwood (9-7 overall) rally to tie the game each time. Lauren Griswold broke a 14-14 tie with a sideout kill and Giselle Bennetti followed up with a pair of aces to launch the Tigers on a 9-2 run that put them ahead 23-16. The Bowmen got as close as 24-21 before Benetti slammed a kill to wrap it up at 25-21. Newberg looked to be cruising in the second set, taking a 17-8 lead on an ace by Griswold. But Sherwood would score the next 15 points to rally for a 23-17 lead before closing it out 25-19. Sparked by a back-row sideout kill by senior libero Grace Kassebaum, the Tigers scored four straight points to go up 10-7 early in the third and never trailed en route to a 25-17 win. As usual, Benetti secured the final point with a kill. Newberg was on the brink of closing the match out 3-1 after going up 24-20 on a kill by junior Rebecca Upchurch, but Sherwood would score the next six points to win the set 26-24 and force a decisive fifth set. Fittingly, the lead went back and forth in the early going, with Newberg getting a sideout kill by Benetti, followed by an ace by Kassebaum, to take an 8-7 lead. Sherwood fought back to tie the score at 11-11 on a kill by senior Alli Douglass and got the next two points to make it 13-11. Newberg rallied back, getting kills by junior Tori Petersen sandwiched around a Sherwood hitting error, giving the Tigers a 14-13 lead. Sherwood tied the score at 14-14 on a tip by junior Allison Fiarito, but a sideout kill by Petersen gave Newberg a 15-14 lead. Then, with senior Carly Cuddeford serving, Sherwood was whistled for a net violation, giving Newberg a 16-14 fifth-set win, and the match. "Last night was a fun win for the team," Upchurch said. "We overcame some deficits by working as a team, displaying confidence and composure individually as well as trust in each other and our systems. We're focused on finishing the season strong and earning our spot in the playoffs." The Tigers will begin the stretch run with a home contest versus Forest Grove at 6:45 p.m. before closing out against McMinnville (9-8, 5-4) and first-place Glencoe (12-7, 7-2) next week.